KABUL, Afghanistan — President Hamid Karzai held an unprecedented meeting yesterday with representatives of a major Taliban-linked militant group, boosting his outreach to insurgency leaders to end the eight-year war. Less certain is whether the talks with the weakened Hizb-i-Islami faction represent a game-changer in the conflict, given its demand to rewrite the Afghan constitution and force a quick exit of foreign forces. It is the first time that high-ranking representatives of the group, led by warlord Gulbuddin Hekmatyar, have traveled to Kabul to discuss peace. The reconciliation offer from Hekmatyar contrasts with his reputation as a ruthless extremist. Hekmatyar’s power has waned over the years and he commands far fewer fighters than the Taliban. Nevertheless, Hizb-i-Islami is very active in at least four provinces of eastern Afghanistan and parts of the north. His defection from the insurgency would be a coup for Karzai and could encourage some Taliban commanders to explore peace deals. Talking with the Taliban and other insurgent groups is gaining traction in Afghanistan, even as thousands of US and NATO reinforcements are streaming in to reverse the insurgents’ momentum. The talks have not stemmed the fighting. 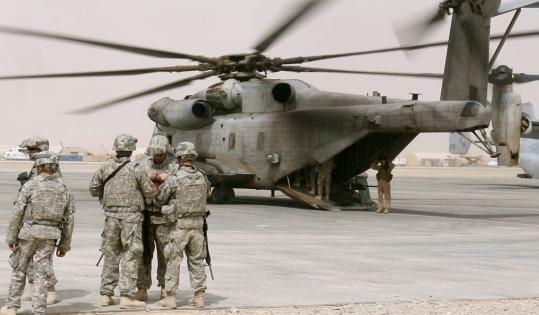 NATO reported three service members were killed yesterday in separate explosions in southern Afghanistan. Hekmatyar, who is in his 60s, was a major recipient of US military aid during the war against the Soviets in the 1980s but fell out of favor with Washington because of his role in the civil war that followed the Soviet withdrawal. The US government declared Hekmatyar a “global terrorist’’ in February 2003, saying he participated in and supported terror acts committed by Al Qaeda and the Taliban. Unless that tag is removed, the designation could complicate any move by the United States to sign off on a deal, even though in recent years Hekmatyar has expressed a willingness to negotiate with the Karzai government. A spokesman for Hekmatyar said the delegation had lunch with Karzai at the presidential palace and planned to meet with him again. Karzai’s spokesman, Waheed Omar, said the president would study the peace plan. However, Maqbul Ahman, a deputy to a Karzai adviser who met with the delegation, said the sides had resolved about 60 percent of the issues being negotiated. He predicted an agreement could be reached before the end of the week. Minister of Economy Abdul Hadi Arghandiwal, leader of a political party that split off from Hekmatyar, said contacts that had been underway for months were apparently moving forward, or the delegation would not have made the trip to Kabul. “I welcome this effort. I hope that this kind of negotiations continues and that we will witness a delegation from the Taliban coming to start negotiations,’’ Arghandiwal said. The Hizb-i-Islami delegation is led by Qutbudin Halal, who served in the government of President Burhanuddin Rabbani in the 1990s, and includes a son-in-law of Hekmatyar. Three members of the group arrived in Kabul from Europe on March 6, according to a member of the group who spoke on condition of anonymity to discuss the negotiations. Two others arrived in the past few days. Besides Karzai, the delegation has met with Vice President Mohammad Qasim Fahim; top members of parliament; the president’s half brother, Ahmed Wali Karzai; presidential advisers; and jihadi leaders. Harun Zarghun, a chief spokesman for Hizb-i-Islami, said the delegation also hoped to meet with Taliban leaders somewhere in Afghanistan. The delegation member said the group was determined not to leave the capital without a deal. But some of the demands might be hard for Karzai and his international partners to accept. The top demand, repeated throughout the plan, is for foreign forces to begin withdrawing in July — a year ahead of President Obama’s desired deadline to begin a pullout. After foreign troops leave Afghanistan, the group said presidential, parliamentary and provincial elections should be held in the spring of 2011.